Natural tocopherols. Soft Gel Shell: Beef gelatin, glycerin, water. This product is regularly tested (using AOAC International protocols) for freshness potency and purity by an independent, FDA-registered laboratory and has been determined to be fresh, fully-potent and free of detrimental levels of mercury, cadmium, lead, PCBs and 28 other contaminants. Take two softgels once daily, at mealtime. 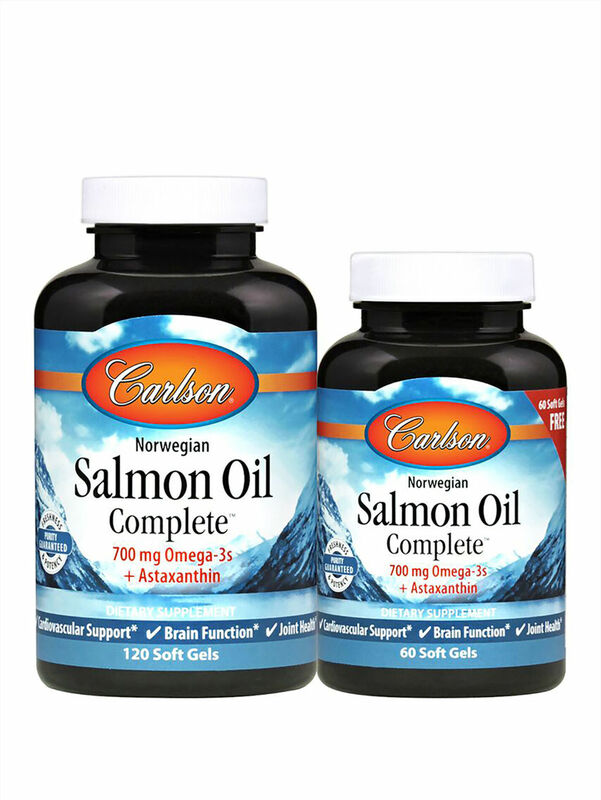 Salmon Oil Complete provides 15 different fatty acids, including omega-9, omega-7, omega-6, and the important omega-3s EPA and DHA. It also naturally contains astaxanthin, which gives salmon its pink color, helps preserve freshness, and plays and important role in fighting free radicals. Contains fish (salmon, anchovy, sardine and mackerel). Other ingredients: Natural tocopherols. Soft Gel Shell: Beef gelatin, glycerin, water.